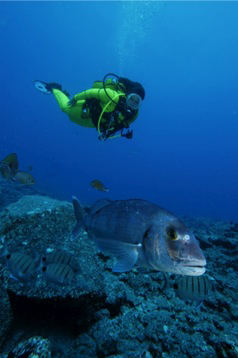 The “Acantilado de Los Gigantes”, fifth annual underwater photographic competition, sponsored by the City Council of the Historic Village of Santiago del Teide, with the collaboration of the Tenerife Cabildo, will take place from July 3rd – 10th 2010. The Digital Underwater Photography Contest “Cliffs Los Gigantes” is open to all underwater photographers who wish to take part. (Subject to the number of places and compliance with the rules of the competition). Entry fee is € 150 for Category A and 120 € for Category B. This fee includes participation rights in the contest and a place on four boat dives departing from Los Gigantes Marina. 1. First place: trophy and 2,500 euros. 2. Second place: trophy and 1,500 euros. 3. Third place: Trophy and $ 1,000. 1. First place: trophy and 1,000 euros. 2. Second place: Barbolight LED Flashlight.